Jute. It’s not a word commonly used in the English language – certainly not something I would have known the meaning to prior to researching for this article and yet jute is something many of us have become accustomed to living with in our everyday lives. As it happens, “Jute is the most popular natural fiber next to cotton. 90% of the world’s total production of Jute is harvested in Bangladesh. That’s why Jute is called the Golden Fiber of Bangladesh” (Cotheeka, 2012). But what exactly is jute? Jute is a “vegetable fire that can be spun into sackcloth” (Ethirajan, 2012). It’s other more commonly known name is “burlap.” For everyone out there in the world today that is aiming to be as eco-friendly as possible, burlap is definitely the way to go. As jute is bio-degradable, it “has become the preferred alternative to polluting synthetic bags” (Ethirajan, 2012). With its strong fiber and quality durability, it’s no wonder that the demand for jute is on the rise in Bangladesh. As an input to the jute manufacturing (goods) industry, the demand for jute is derived in demand. Nearly 75% of jute goods are used as packaging materials, burlap (hessian) and sacks. Carpet backing cloth, the third major jute outlet, is fast growing in importance. Currently, it consists of roughly 15% of the world’s jute goods consumption. The remaining products are carpet yarn, cordage, felts, padding, twine, ropes, decorative fabrics and miscellaneous items for industrial use. Quite recently, jute has entered the non-woven industry as it is one of the most cost effective high tensile vegetable fibres. Therefore, the demand for jute has made its way into the automotive industry. Just is now being used to manufacture more eco-friendly interiors for cars and automobiles. With the change in attitude towards synthetic products worldwide, it is no wonder that “jute exports from Bangladesh have surges – up 70% year-on-year in 2010 – with the fiber now the country’s second largest export after garments” (Sreeraman, 2010). But it’s not just a change of attitude in Westernized countries either. Bangladesh happened to lead the world as one of the first countries to ban plastic bags (2002). Why wouldn’t you when you have one of the strongest and most affordable fibres at your fingertips? The importance of jute is becoming clearer and clearer every day. Nearly every person in the world has a bag of some kind. There are even people that collect bags. 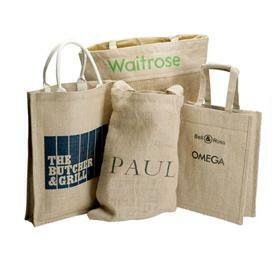 Between shopping bags, canvas bags, wine bags, gift bags and promotional bags, there is no end to the makings of jute. In 2010 alone, Bangladesh “exported US$547 million worth of jute goods” (Taipei Times, 2010) which has caused many to start to see jute as a “huge future as an export for Bangladesh” (Taipei Times, 2010). In knowing this, Tradecraft, a UK-based fair trade charity, has developed a program on how to reach the poorer rural communities in Bangladesh and help to establish the cultivation of jute crops. As jute is an eco-friendly resource that can be simply cultivated (in monsoon season, no less), it only makes sense to develop a program to use in rural communities to help build them up. The demand for jute is only increasing as time goes on and more uses for this natural fiber are found. Jute is not only helping the environment, it is helping Bangladesh’s economy and is providing work & income for the poorer communities of this beautiful country. So get onboard – burlap is in. By your potato sack and know that your purchase is more than just a smart one. It could help change the world.